Volleyball shoes are a necessary purchase for anyone who is thinking of participating in this growing sport. Learn more about this specialized footwear and what to look for. Volleyball is one of the fastest growing sports both here in the U.S. and abroad. The popularity of this competitive game has inspired shoe manufacturers to design specific footwear that can go beyond the typical and formerly used basketball court shoe. Today's volleyball players are fortunate to have a wide variety of quality supportive athletic goods that were not previously available to enthusiasts. While their appearance is similar to that of basketball shoes or cross trainers, volleyball shoes are unique in their own right. The main component of the shoe is its rubber outer sole. This gum rubber material gives athletes superior traction in gyms and on other indoor floor surfaces. Furthermore, with the expanding trend of outdoor volleyball, some manufacturers have designed a shoe with an outsole specifically tailored for playing on grass and in sand. The midsole of the volleyball shoe is also important. The technique of the sport requires you to spend a lot of time on the ball of your foot, meaning that materials in the front of the foot need to be strong and flexible. The midsole is the section of shoe which absorbs shock, and it is usually made of some sort of foam. Shock absorbers such as gel and air are also included in the midsole, cushioning the body from hard impact and injury. Volleyball shoes usually contain a suede upper. This can also consist of a mesh-like material. The upper lightens the shoe's weight and allows your feet to breathe. You can also purchase volleyball shoes with a built in ankle brace for those who desire extra support. The website Volleyball.com is an excellent resource for those who are looking to learn more about volleyball and the best shoes available. Covering both men's and women's brands, you will get a great perspective on which shoe is right for you. Shoe quality and expectations will vary based upon what genre of volleyball you are participating in. 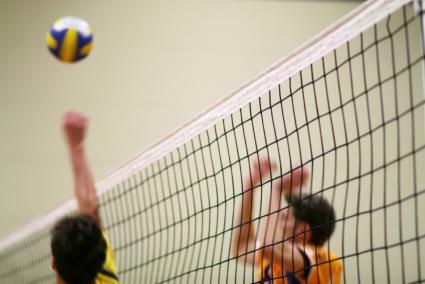 A high school volleyball team will have different requirements than those of a casual game played in the park on the weekend. Additionally, a shoe that may be appropriate for high school games may not be up to par when it comes to the pro circuit. Kaepa also carries a great selection of volleyball shoes that can help you with your decision making process. From recreational to competitive, they can recommend where to purchase the best volleyball shoes available. Not unlike other sports, volleyball can be an expensive pastime. However, your shoes do not have to break the bank. Dozens of discount websites have cropped up, offering bargains on otherwise pricey footwear. Quality is not necessarily compromised, since these discounts are often based upon closeout sales and factory clearances regarding the top brands available. If you are new to volleyball or unsure if you want to spend a lot on the sport, then these discount websites can be a great resource. You can also check at your local high school or recreation center to see if there are any shoes available to rent. Many keep extras on hand for physical education classes and for flighty team members, making it definitely something worth considering. If you are one of the budget-conscience people mentioned above, there are plenty of options for you. Also, if you are not a volleyball enthusiast but know someone who is, there are plenty of gift giving choices beyond the shoes. Consider an equipment bag made out of mesh fabric. Inexpensive and impossibly durable, these bags are a great gift for any player that is traveling to games or back and forth from practices. Kneepads are great presents for a volleyball player. Combine this with a pair of socks and a new ball, and you will have the perfect gift arrangement for your favorite athlete. No matter where you are in the world of volleyball, knowing how to keep your feet safe and comfortable while playing is a great advantage both personally and professionally. Protecting your health and the quality of your game will keep you playing for years to come.